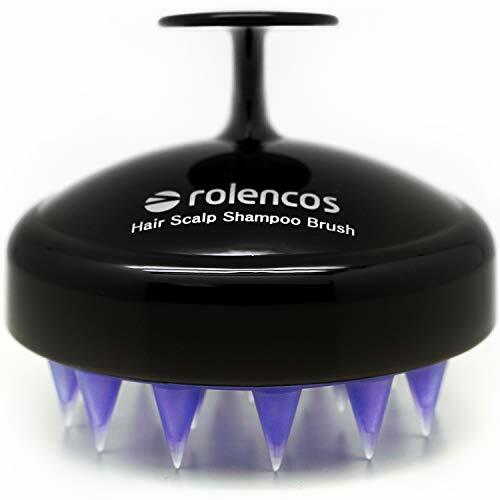 Useful for all Hair types with soft thick silicone bristles on dry or wet. Easy to use, massage your scalp and deep clean scalp with less shampoo and conditioner. Strengthen the roots of hair, moisturize hair. Relax the scalp muscles and help the headache disappear faster. Perfect brush to keep in your shower for daily use. For women, No need to worry about your long nails. For men, Deep clean and reduce stress. Make a game-changing addition to your shower routine. 1.Ship by Amazon Prime Shipping. 2.RISK FREE: We offer an extended 30-day money back guarantee period in which you can return your massager for any reason. We also offer a 1 year warranty. If anything happens to your device within the 1 year warranty period, we will send you replacement model at no cost to you. 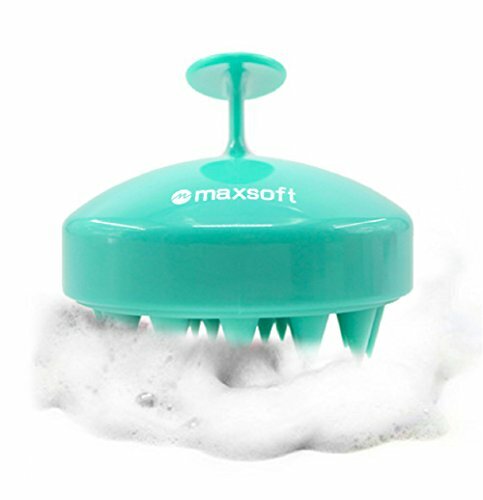 MAXSOFT BRAND : Pls read carefully before purchasing. Pls note that this product is made MAXSOFT. IF NOT, without any responsibility on our part!!! We provide return and exchange service of goods, we guarantee to your satisfaction. MAXSOFT is always dedicated into providing the best service and products to every customer. We have our own manufacturer, so we can guarantee our product's quality. 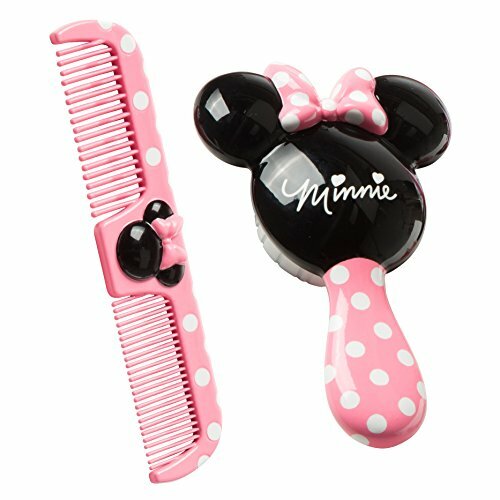 Make your daily grooming routine fun with the cute and colorful Disney Baby Minnie Hair Brush and Wide Tooth Comb Set. With easy-grip handles, this set gives you better control while grooming your child's hair. Extra-soft bristles on the brush are gentle on your child's scalp while brushing. For thin or thick hair that is dry or wet, the comb has two sets of teeth for detangling. 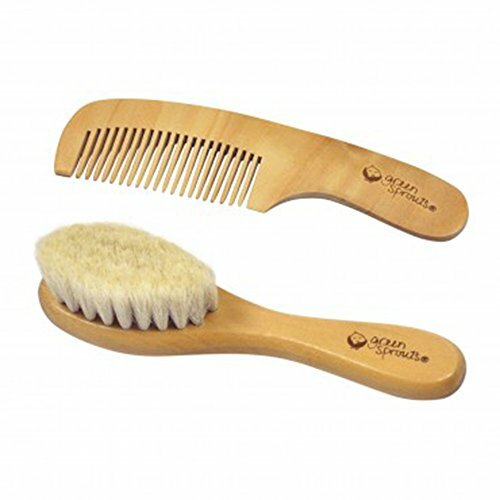 Both the brush and comb are sized just right for little hands, should your little one want to try it on his or her own. This pack includes one Minnie Mouse-themed baby hair brush and comb. Shopping for baby can be a joyful discovery that starts with Disney Baby and ends in your home. Disney Baby takes pride in helping families connect by offering apparel, gear, toys, play mats, bedding, and other items that inspire every moment of the day. 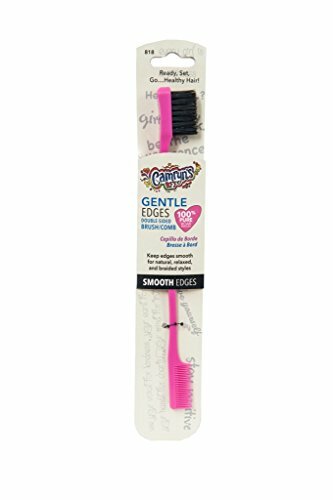 Camryn's BFF gentle edges double-sided brush/comb with 100% pure soft boar bristle brush is designed to keep edges laid and smooth. The pure boar bristles stimulates the scalp and distributes natural hair oils to promote healthy hair growth. The comb helps to straighten and polish for a complete finish. Slender handle design allows for easy handling and on the go styling needs. EE-T003SBLKP. Wash in warm, soapy water. Rinse and leave to dry away from direct heat and sunlight. Meet the Paddle Detangler. Not only does the Paddle Detangler gently loosen knots without pulling or breaking your hair, it s also a great tool for brushing through conditioning treatments and hair masks. The vented design makes it easy for water and excess product to escape the brush, so there s no leftover build-up and clean-up is a breeze. Just rinse it and repeat. Our Paddle Hair Brush features ultra-soft IntelliFlex bristles that glide through tangles and knots with ease. They are firm on one stroke and flexible on the next. Brush out tangles easily, with no more pulling, tugging, or pain and no split ends or hair loss. BUY WITH CONFIDENCE: We work hard on providing a 100% Customer Satisfaction. If you experience a manufacture defect within the first 30 days of purchase, please contact us and we will gladly replace your brush! 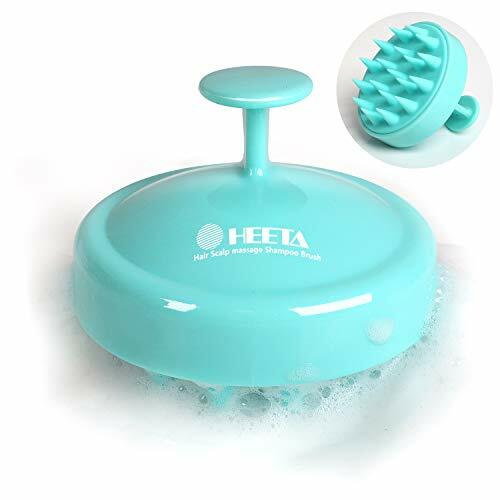 Advantages of purchasing this scalp / head massager is that you can use it at home, not only for washing hair as a shampoo brush, but also when you are watching TV, reading books and more to massage your scalp. Suitable for all type of hair no matter it's dry or wet, this scalp massager provides a very pleasant massage experience, stimulate the scalp follicles and take effect in preventing hair loss. This product is a very good handheld head massager. 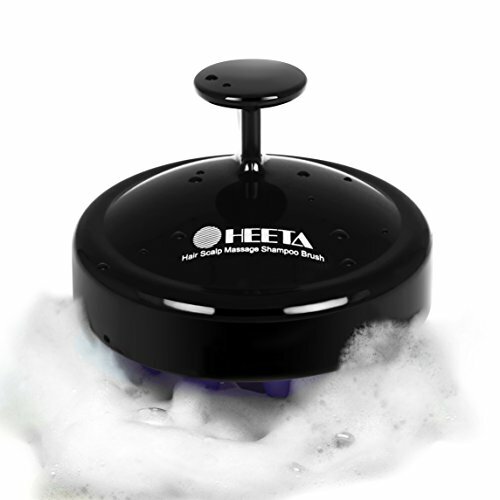 It is small and compact, and it's manual that you can control the strength to have a enjoyable massage experience. This scalp massager is waterproof, so you can use it while you're in the shower. Best for protecting your scalp and relaxing your head. If you have any problems, please contact us, as our shampoo brush comes with a one year warranty. Manual operation. Waterproof, no battery required. Perfect for various hair styles from thick to thin, short or long, and no matter wet or dry, even to groom hair of animals. Taking shower with this soft shampoo brush makes your hair and scalp cleaner. 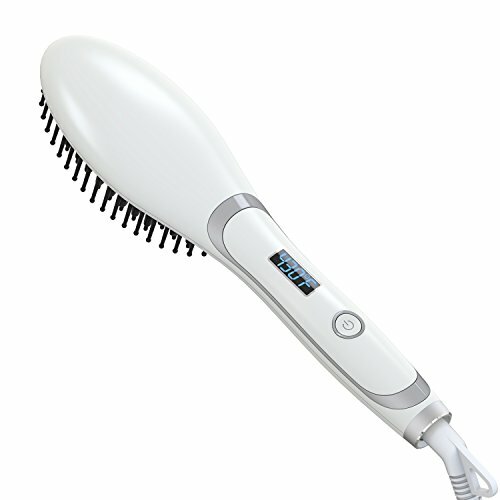 High quality and soft hair brush provides you a enjoyable washing experience. Massages your scalp in the shower to ease itchiness and promote blood circulation. Getting a relaxing massage at home and every time you wash your hair. Ergonomic design perfectly fits in your palm and is easy to hold. Only 1.8 Oz, lightweight and stores easily. 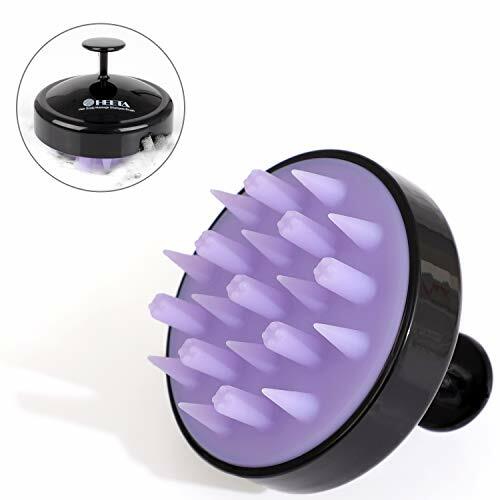 Excellent scalp massager is suitable for whom has long and manicured nails, you won't damage your manicure during washing hair anymore. Revlon s inspiration is beauty and committed to the positive impact it has on our lives. The passion for beauty and what makes you feel beautiful translates to our commitment to achieve stunningly beautiful hair effortlessly with the latest technology and styling solutions to empower you to create hair styles that make you look and feel beautiful. Our hair styling tools are engineered with technological innovation to help support less damage and feature style advancements to create the looks you love. ABOUT THE PRODUCT: Gentle and beautiful, a vision of you, Essentials Soft Feel cushion brush will help you detangle your hair and smooth out curls. With rubberized finish to provide you with a firm grip when styling. The healthy way to brush your hair. How you brush your hair is the key to strong and healthy hair and the single most overlooked step in hair care. Hair is weakest when wet and pulling at it can snap it like a rubber band. This is why you should brush with a tool that gently loosens knots without pulling or breaking hair. Wet Brush Original Detangler Hair Brush is made of Exclusive, ultra-soft IntelliFlex bristles that glide through tangles and knots with ease. 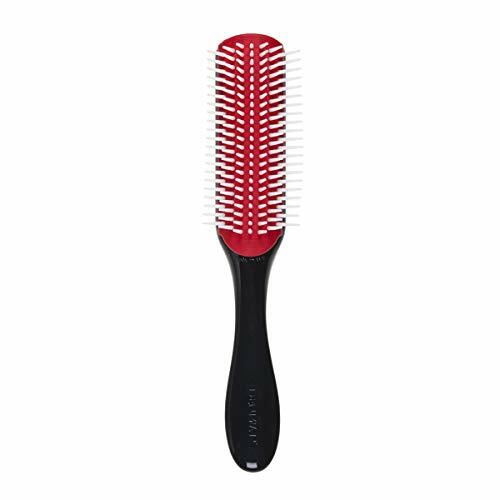 The sturdy bristles gently massages the scalp while stimulating blood flow and strengthening your hair. Our Hair Brush is designed brilliantly to minimize pain and to protect hair against split ends and breakage. It lets you brush with less force so you can detangle with less damage to your hair. Doesn't matter if your hair is long or short, curly or straight, thick or fine, this brush will run through any hair type removing tangles while making the hair soft and is great for hair extensions and wigs - A revolutionary brush that glides through tangles without breakage or pain! How you brush your hair is a key factor in reducing hair loss and promoting stronger hair. Francesca Brush pack of 2 hair detangling brushes use soft yet firm bristles that glide through tangled hair without pulling or yanking to help you achieve the smooth, tangle-free hair you've always wanted. Our anti-static hair brush untangles your hair as it goes through it so that you don't have to worry about any breakage, split-ends or hair loss. Whether you have long, short, curly or straight hair, you can count on our detangling hairbrush help you achiever shinier, softer, silkier and smoother hair without causing any irritation or discomfort to make sure your hair looks just as fabulous as you! Our hair detangler brush is anti-static and can safely be used on both wet and dry hair. The soft bristles gently massage your scalp as you brush to stimulate blood flow to help reduce hair loss and promote the growth of stronger, healthier hair making it the perfect choice for both men, women and even kids! Click on the "Add To Cart" button to order today to make your hair smoother, minimize hair loss and promote hair growth with Francesca Brush hair detangler brush set. 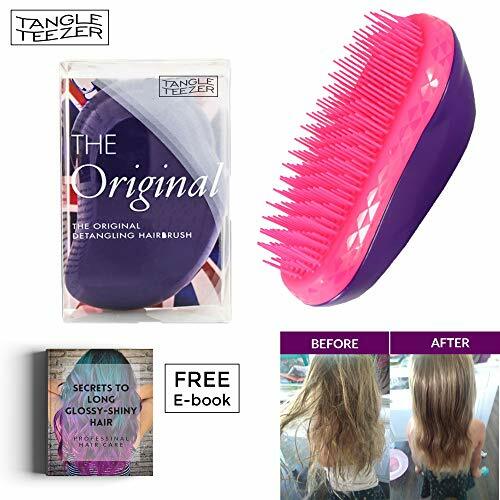 NO MORE TANGLED HAIR This tangle hair brush is ergonomically designed to provide you with a comfortable, simple and reliable way to untangle hair. This detangling brush gently flows through your hair without causing any pain or discomfort to give you the smooth and shiny hair you've always wanted. LESS HAIR LOSS & BREAKAGE Are you worried every time you look at your hair brush after using it? If yes, then you're using the wrong brush. 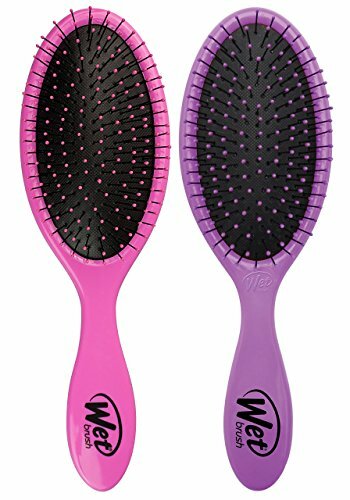 This pack of 2 wet hair brush detangler is carefully designed to minimize breakage, hair loss and split ends to help you maintain long, smooth hair. 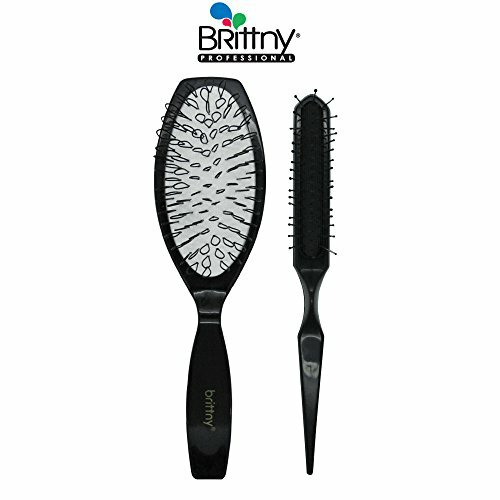 STURDY & NON-SLIP DESIGN Thanks to the anti-slip coupled with the flexible yet firm bristles, our anti-static hair brushes stay safely in your hand without slipping to untangle your hair without yanking, pulling or hurting it while the durable construction ensures long term and reliable use. PORTABLE & EASY TO USE Our detangler hair brush uses a compact design as well as being lightweight allowing you to take it with you anywhere you go while the ergonomically designed handles keep your hands comfy when brushing making these hair detangler brushes ideal for everyday use. IDEAL FOR ALL HAIR TYPES Whether you're looking for a detangler kids hairbrush or a wet hair brush to help you style and groom your hair, you can always count on our detangling hairbrush to get the job done. It's ideal for all kinds of hairs both wet and dry including frizzy, straight, wavy, curly and more! No Tears! No Tangles! No Tantrums! - The Remington Tame The Mane Electric Detangling Brush makes everyday detangling fast and easy! It s as simple to use as a traditional brush or comb just glide the detangling brush through wet or dry hair and be amazed as knots and tangles are quickly smoothed out! The brush s teeth rock back and forth as they move through hair to gently loosen tangles with minimal pulling and maximum comfort. This battery-powered brush (two AA batteries included) is the perfect way to manage unruly hair. Give it a try and see why thousands of satisfied customers trust the Remington Electric Detangling Brush to Tame The Mane. *Results may vary by hair type and technique. Perseverance: Our company is committed to creating the perfect product, so that customers who use our products have a happy mood. Service: We will do our best to satisfy you. If you have any problems in the product, I hope that you can contact us directly. We will solve it immediately and let you have a pleasant shopping experience. 3 in 1 is more valuable. Low price is just promoted for 1 month, buy it soon. 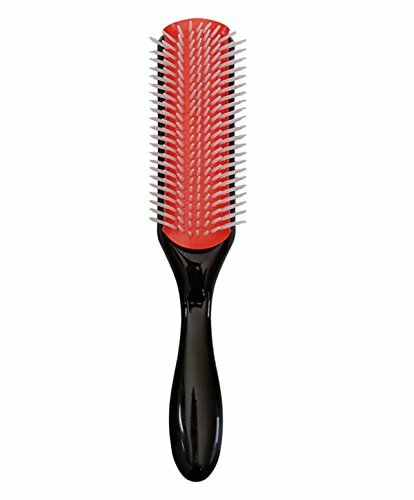 9-ROWS NYLON BRISTLE CUSHION BRUSH: Anti-static rubber pad that provides maximum grip and control during blow-drying for shaping hair. Perfect for smoothing, shaping and polishing the hair. Ideal for thicker, longer hair. 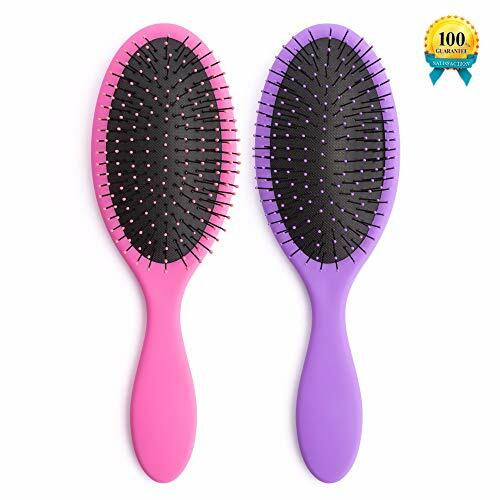 2 PCS SIDED EDGE CONTROL HAIR BRUSH: This brush is a little stiff, the red part can be folded out to clean.If the red part falls out, please don't panic, it can be put back.Pure boar brush on one side, comb on the other side. Pure boar bristles promotes healthy hair growth and retention. Comb end grooms and smooths edges for a polished finish. Great for all hair types especially the gentle edges of your little one. FREQUENTLY BOUGHT TOGETHER: Denman hair brush, Schwarzkopf got2b styling mousse, got2b glued spray, Got 2b hair glued gel, Ebin 24 hour edge control tamer, Eco olive oil styler gel, Beautify beauties Spray, Aunt jackies flaxseed gel and conditioner, Ghost bond lace wig glue, Cantu curl cream, Cantu shea butter, Cantu leave-in conditioner, Hicks edge control styling gel, Designer essential oils, Argan creme of nature, Murrays beeswax, Black vanilla edge control. 30 DAYS GUARANTEE: If any other issue, Please feel free to contact us for solution, we'll reply you in 24 hours, we will try our 200% effort to make you 100% satisfy. Or please return it within 30 Days and Get Full Refund. So Get the hair brush and edge brushes with risk free now! All of Rolencos products are only focused on your lovely skin and other factors that cause skin trouble are excluded. We always listen to our customers voice and strive to make better products. scalp to strengthen the immune system and detoxification. Perfect grip handle to fit in the palm of your hand comfortably. Strengthen the roots of your hair and nourish the hair shafts. Stimulate blood and air flow to the scalp and oil glands. Baby Brush & Comb gently grooms baby s growing hair with all-natural, renewable wood and goat hair bristles. The super soft bristles delicately smooth baby s hair, and the comb helps remove any tangles as baby s hair grows.Care - Clean before use and after each use. Surface wash with warm water and mild soap. Do not soak or immerse in water. Dry with a soft cloth. Includes 1 brush and 1 comb Natural wood. Extremely soft brush Get rid of tangles and keep hair soft with this brush and comb. Long or short, curly or straight... it doesn't matter what kind of hair you have, this brush will make your hair soft, shiny, silky and soft. How? Upon contact with hair, the flexible bristles loosen knots so that the brush glides through hair ensuring each strand is treated in a delicate manner to produce shine and minimizes breakage. No More Tears, No More Fuss - Kids Really LOVE This Brush! It's time to leave the house and you prepare yourself for battle. There's chasing and yelling. You're mad, your little ones are crying, everyone is miserable and now you're running late. If all that could go away wouldn't it put a smile on your face. Of course it would! And if this brush doesn't do what we say, you get that money back, Guaranteed! We are so certain you'll love this brush, we offer a MONEY BACK GUARANTEE, so order TODAY! You have nothing to lose and beautiful hair to gain! ORIGINAL GLIDE THRU BRUSH - Ever since the Glide Thru Detangling Brush launched, other companies have tried to copy it! But only the Glide Thru Detangling Brush has firm, quality bristles that will not lose their shape! THE BEST AT REMOVING KNOTS AND TANGLES - Ordinary bristle brushes work against the hair, basically ripping through and pulling out the knotted hair instead of gently separating it! But the unique cone shaped plastic bristles work to separate the hair sideways instead of down, gently unraveling even the toughest tangles. CHILD FRIENDLY - No more fits when it's time to get ready to go out! The Glide Thru brush doesn't dig into the scalp or rip out hair like other brushes. It takes out tangles without yanking or hurting. One customer review states, My daughter used to cry every time Mommy brushed her hair. This brush is the best thing I ever bought for her. 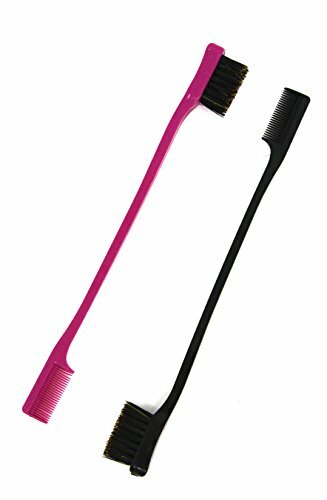 LIFE CHANGING BRUSH - Other brushes have beads at the end that can dig into the scalp and cause pain and get caught in tangles. The Glide Thru brush has painless soft plastic bristles that massage the scalp and increase circulation, which may help increase hair growth. One customer writes: I brushed my hair for at least 2 or 3 minutes because it felt so good. It also smoothes the cuticle layer, making your hair shine! SATISFACTION GUARANTEED - Everyone's experience with a hairbush is different. If you aren't completely satisfied, contact us to return your brush, no questions asked! Wet Brush Squirt Detangler Hair Brush features Exclusive, ultra-soft IntelliFlex bristles that glide through tangles and knots with ease. 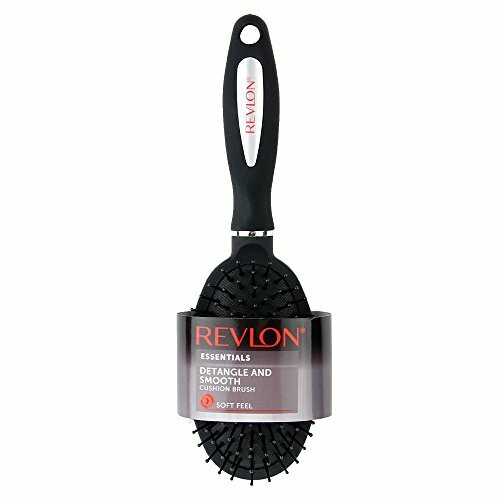 The sturdy bristles gently massages the scalp while stimulating blood flow and strengthening your hair. It is designed brilliantly to minimize pain and to protect hair against split ends and breakage. It lets you brush with less force so you can detangle with less damage to your hair. Our hair brush works great on wet or dry hair and is perfect for men, women and kids; it also works great on hair extensions and wigs. We shrunk our Original Detangler, smaller, cuter and perfect for life on-the-go - Little brush, big results: The Detangler for life on-the-go! The multi-award winning detangling hairbrush. Tangle Teezer's genius designed teeth flex just the right amount to de-stress, detangle and smooth the hair's cuticle. Tangle Teezer is also hair extension and weave friendly, unlike ordinary brushes and combs which catch, tug and snag. Tangle Teezer effortlessly blends with existing hair creating a seamless and flawless finish. Tangle Teazer. THE PERFECT WET OR DRY HAIRBRUSH. Manage your mane post shower or when it's dry as you gain control and say goodbye to frizz. Comb through knots and tangles freely using an easy grip with the Tangle Teezers ergonomic palm-shaped design. INNOVATIVE DESIGN. The unique two-tiered system has long teeth to detangle and short teeth to smooth the hair cuticle. This award-winning brush allows you to brush your hair with minimum fuss, breakage, and damage, leaving you with glossy locks. LOCKS YOU LOVE. This easy to use detangling hairbrush gives you the control you need and confidence you want to make every hair day a good one. HEALTHY DETANGLING Ouch! We all know how detangling hair feels if it isn't done right. Our detangling hairbrushes confidently, but gently detangle all hair types thanks to our innovative teeth technology. It's the very first step to healthier and fabulous looking hair. Little wonder they're world-famous! 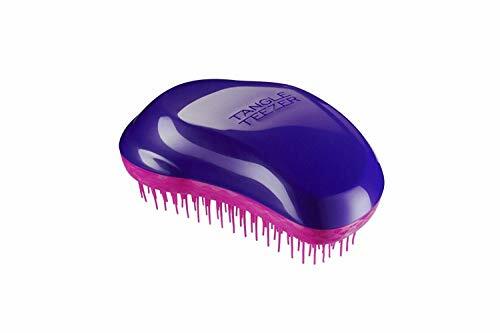 Why Tangle Teezer Professional Wet & Dry Detangling Hairbrush? LIFE CHANGING BRUSH - NO MATTER WHAT YOUR HAIRTYPE! - Highly recommendedfor your babies, your best friends! SAY GOOD BYE TO TANGLEDDAMAGED HAIR! This sensational detangling hairbrush removes knotsand tangles as soon as you start brushing, no need for painful pulling andunnecessary hair breakage. Detangler hair comb's genius designed teethflex just the right amount to de-stress, detangle and smooth the hair'scuticle. Easy-to-hold hair brush instantly detangles andremoves stubborn knots for more manageable, and healthier looking hair. Theergonomic brush style makes it easier for you to hold so you get the exactstyle you want. WE MAKE DIFFERENCES BECAUSE WE CARE! There are many Detangling Hair Brush brand in the world out there. However, we put customersatisfaction as top priority and will do anything to make it better day by day.The Straightening hair comb is also always improved and tweaked to your taste. NO MORE TEARS, NO MORE FUSS -KIDS REALLY LOVE THIS BRUSH! You're mad, yourlittle ones are crying, everyone is miserable and now you're running late! 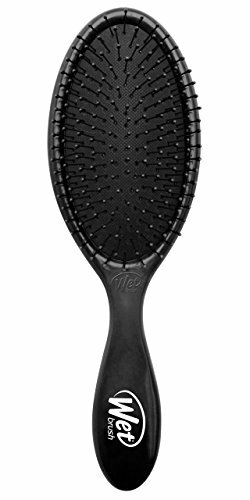 Saygoodbye to it with WeCARE Detangling Hairbrush. And if this Detangling Hair Combdoesn't do what we say, you get that money back. Guaranteed! # How To Make EVERY Day a Good Hair Day? 1. Order the WeCARE Detangler Haircomb byclicking the ADD TO CART button. 3. Use the brush every day and never have another "bad hair day" again! PERFECT WET & DRY DETANGLING - No matter if your hair is wet or dry, you can have smoother, shiner with less fly away hair in minutes and with just a few strokes. WeCARE Straightening Hair Comb is highly recommended for separating fragile strands of hair right out of the shower, protect thinning, fine, and color treated hair and is gentle enough for your wigs, weaves and hair extensions. STIMULATING HAIR GROWTH LIFE CHANGING BRUSH - Other brushes have beads at the end that can dig into the scalp and cause pain and get caught in tangles. 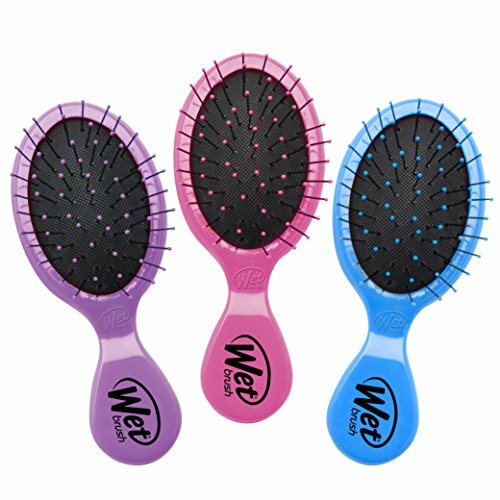 WeCARE brush has painless soft plastic bristles that massage the scalp and increase circulation, which may help increase hair growth. One customer writes: I brushed my hair for at least 2 or 3 minutes because it felt so good. It also smooths the cuticle layer, making your hair shine! INNOVATIVE DESIGN LEAVING YOU WITH GLOSSY LOCKS - The unique two-tiered system has long teeth to detangle and short teeth to smooth the hair cuticle. This award-winning brush allows you to brush your hair with minimum fuss, breakage, and damage, leaving you with glossy locks. 100% MONEY BACK GUARANTEE - WeCARE tries to provide you with best experiences at an optimal expense, and yet customer satisfaction is our utmost priority. If you are unhappy with iCARE Professional Wet & Dry Detangling Hairbrush, we will offer you a replacement or 100% refund. Try our Detangler Hair Comb risk-free and worry-free! Low price is just promoted for 1 month, buy it soon. This brush is a little stiff, the red part can be folded out to clean.If the red part falls out, please don't panic, it can be put back. That doesn't really make finding the best hair brush for yourself any easier! You may be worrying about your tangled hair and electrostatic problems, poor plastic combs and easily broken body. In response to these questions, we interviewed professional hairdressers and carefully selected this comb set for you. your control but it also provides exceptionally smooth results without breaking the natural pattern of wavy and curly hair. tension in combination with the heat from the hair dryer. Smooth, round-ended pins penetrate the hair safely for gentle styling without damage. from bottom to top and tie your hair in a loose bun to ensure you won't wake up with morning tangles. with this hair comb. It makes everything so much easier. we are so confident that you will be 100% delighted with your purchase, we offer 100% MONEY BACK GUARANTEE, you can try it rise free. 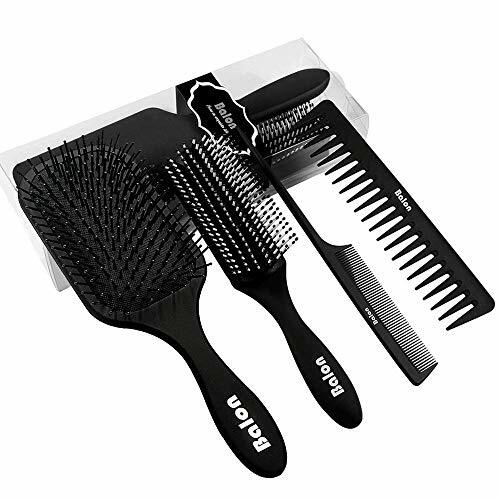 4 IN 1 HAIR BRUSH SET: This is a detangler brush and comb set which include 4 kinds of brushes and combs. Paddle brush, styling brush, wide tooth comb and tail comb. The best hair brush can meet your different hair care needs. PAINLESS AND SMOOTH: Painless soft plastic bristles that massage the scalp and increase circulation, which may help increase hair growth. It also smoothes the cuticle layer, making your hair shine! Best at removing knots and tangles for wet or dry hair. ANTI-STATIC BY CARBON MATERIAL: All of the comb for hair are made of carbon material antistatic, the soft pins bring superlative toughness and durability. Extreme solutions to hair winding and electrostatic problems. FIT FOR ALL HAIR STYLE: No matter what kind of hair style you are, there is always one for you. Works great on wet, dry, Long, short, thick, curly, and detangler hair. Perfect comb for women, men and kids with all hair types. It is the perfect GIFT SETS for mother, sisters, female friend. 100% SATISFACTION GUARANTEE: Your satisfaction and comfort is our passion! We promise these are the most useful hair brush set you will ever own. if you don't absolutely love your hair brush for any reason, let us know and we'll refund your money back or send you a replacement! that is how confident we are that you will love it! DON'T WAIT, ADD TO THE CART NOW! New design makes you feel more comfortable and easier to use. Helps reduce stress,promotes hair growth. We provide 2 different colors, light green and purple. The Most Important that these scalp massagers are in High Quality with Affordable Price! 1. New design for a more comfortable grip.Two-way design,both right and left hand can be used.The teeth is more longer and softer. 2. Massages your scalp in the shower to ease itchiness and promote blood circulation. Relax the scalp muscles and reduce stress.What's more it prevents hair loss by scalp stimulation and help to hair growth. 3. 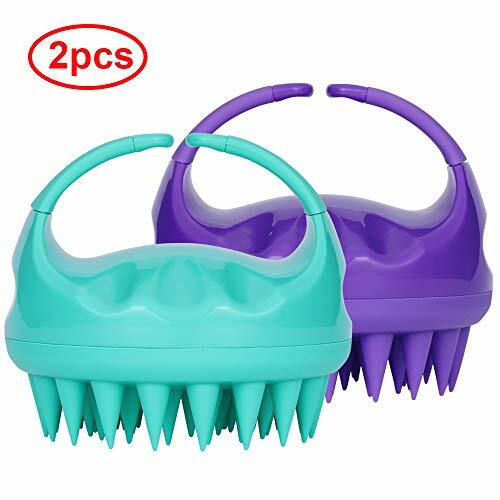 One order includes 2 pieces scalp massagers,one light green and one purple.The scalp massager is made of high quality silicone,prevent finger cuts. 4. Manual operation. Waterproof, no battery required. Perfect for various hair styles from thick to thin, and no matter wet or dry, even to groom hair of animals. 5. 100% SATISFACTION-If for any reason you are unhappy with any product by us, please do not hesitate to contact us. We take full ownership and responsibility for the quality of our products and will do our very best to solve your problem quickly and efficiently!